Introducing Everloop, a new social networking service for youth that places privacy and safety first, yet still provides the tools and features youth expect in a service. Everloop has worked with LOOKBOTHWAYS Inc., the business side of iLOOKBOTHWAYS, and two of our business partners, Privo and Crisp Thinking, to implement the most advanced safety and security functionality on the market. If you have tweens or young teens, have them give it a try. 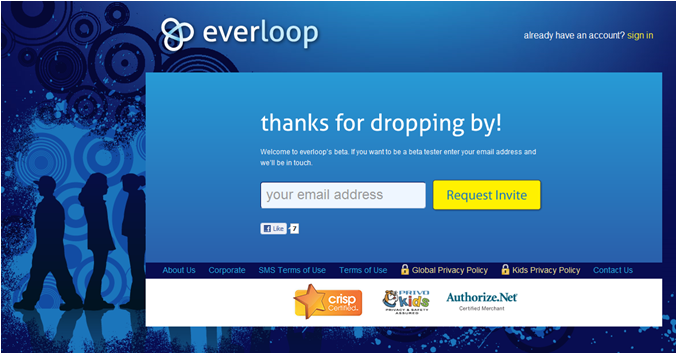 Everloop, the social looping platform specifically designed for users aged 8 to 13, strengthened its user protection measures today by announcing partnerships with online safety groups Crisp, LOOKBOTHWAYS and Privo. The move secures Everloop’s leadership position in privacy protection for social applications, as the company now offers the most comprehensive safety measure of any platform to date. Already an innovator in the social media space, Everloop’s new partnerships further expand its unique social looping model which protects users by allowing them to connect via closed, targeted networks. Everloop’s safety measures now combine the sophisticated monitoring technologies of Crisp, LOOKBOTHWAYS and Privo with the existing dashboard of user-controlled settings offered in its Parental Privacy Panel. Secure Registration: The PrivoLock™ registration and authorization system securely obtains and manages children’s personal information and permissions for websites to ensure compliance with the Children’s Online Privacy Protection Act (COPPA). Moderation & Profiling: Everloop uses the Crisp NetModerator™ U13 moderation and profiling system for social environments. Crisp Thinking is the world’s leading expert on child safety online and designer of NetModerator™. Behavior Profiling: In partnership with LOOKBOTHWAYS, Everloop has incorporated ReputationShare, which uses a proprietary scoring system to rate the online behavior of community members. Parent Participation: Parents control and set their Privacy Panel to monitor their child’s activities and are alerted of actions through email, SMS/text message, or on their Privacy Panel’s dashboard. Everloop is set for a public launch this fall. For more on Everloop please visit: http://www.everloop.com/. Everloop’s mission is to give tweens a protected space where they can connect with friends they know, express themselves, play games, collaborate on projects and discover talents. Everloop’s Social Loop, a loop of privacy around kids’ connections, introduces state-of-the-art privacy protection and monitoring, keeping tweens from sharing more than they should with people outside their approved loops. Everloop offers a Private Label option to the brands that tweens love and other unique partner content designed to tween interests. For more information, visit www.everloop.com. Privo is the first and only solutions provider which is also a Federal Trade Commission recognized independent certifier of companies’ compliance with the increasingly important Children’s Online Privacy Protection Act (COPPA). As the leading third party provider of children’s identity protection and parental permission management software, services and consulting, delivered using its PrivoLock™, PrivoReg™ and PrivoCert™ solutions, Privo addresses the need to create safe, secure online communities for youth audiences and enable client companies to initiate and manage responsible relationships with their online consumers. Please visit www.privo.com for more information. Crisp is the global leader of user management and analytics technology for social media. Established in 2005, the Crisp User Management Platform allows gaming and social network companies to profile, manage, and protect across both moderation and customer service functions from within one single system, using one simple dashboard. With offices in the UK and the United States, Crisp helps brands create engaging and healthy online communities and reduce customer service and moderation costs by more than 80 per cent. Its full reporting and dashboard capabilities analyze levels of user engagement and overall moderation and CSR team performance. Proven to scale, with millions of messages and users per day, the Crisp Platform is the solution of choice by some of the world’s largest online media companies. For more information, visit www.crispthinking.com. This entry was posted on Thursday, September 23rd, 2010 at 1:23 pm and is filed under Linda's Blog. You can follow any responses to this entry through the RSS 2.0 feed. Both comments and pings are currently closed.